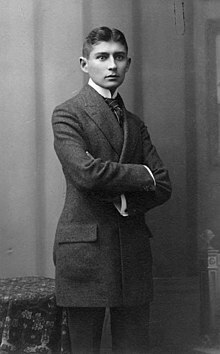 Franz Kafka (3 July 1883 – 3 June 1924) was a Bohemian-Jewish novelist, and was one of the major German-language fiction writers of the 20th century. We are as forlorn as children lost in the woods. When you stand in front of me and look at me, what do you know of the griefs that are in me and what do I know of yours. Plenty of hope — for God — no end of hope — only not for us. Verlassen sind wir doch wie verirrte Kinder im Walde. Wenn Du vor mir stehst und mich ansiehst, was weißt Du von den Schmerzen, die in mir sind und was weiß ich von den Deinen. Und wenn ich mich vor Dir niederwerfen würde und weinen und erzählen, was wüßtest Du von mir mehr als von der Hölle, wenn Dir jemand erzählt, sie ist heiß und fürchterlich. Schon darum sollten wir Menschen vor einander so ehrfürchtig, so nachdenklich, so liebend stehn wie vor dem Eingang zur Hölle. If the book we are reading does not wake us, as with a fist hammering on our skulls, then why do we read it? Good God, we also would be happy if we had no books and such books that make us happy we could, if need be, write ourselves. What we must have are those books that come on us like ill fortune, like the death of one we love better than ourselves, like suicide. A book must be an ice axe to break the sea frozen inside us. What we need are books that hit us like a most painful misfortune, like the death of someone we loved more than we love ourselves, that make us feel as though we had been banished to the woods, far from any human presence, like a suicide. A book must be the ax for the frozen sea within us. Now the Sirens have a still more fatal weapon than their song, namely their silence... Someone might possibly have escaped from their singing; but from their silence, certainly never. "The bliss of murder! The relief, the soaring ecstasy from the shedding of another’s blood! Wese, old nightbird, friend, alehouse crony, you are oozing away into the dark earth below the street. Why aren’t you simply a bladder of blood so that I could stamp on you and make you vanish into nothingness? Not all we want comes true, not all the dreams that blossomed have borne fruit, your solid remains lie here, already indifferent to every kick. What’s the good of the dumb question you are asking?" In conversation with Max Brod (1920), after Brod had queried on there being "hope outside this manifestation of the world that we know", as quoted in Franz Kafka: A Biography [Franz Kafka, eine Biographie] (1937) by Max Brod, as translated by G. Humphreys Roberts and Richard Winston (1947; 1960); at least as early as Franz Kafka : Parable and Paradox (1962) by Heinz Politzer, this assertion has often appeared paraphrased as: "There is hope, but not for us", and sometimes "There is hope — only not for us." Oh, plenty of hope, an infinite amount of hope — but not for us. Variant translation (by David Wyllie): One morning, when Gregor Samsa woke from troubled dreams, he found himself transformed in his bed into a horrible vermin. What a fate: to be condemned to work for a firm where the slightest negligence at once gave rise to the gravest suspicion! Were all the employees nothing but a bunch of scoundrels, was there not among them one single loyal devoted man who, had he wasted only an hour or so of the firm's time in the morning, was so tormented by conscience as to be driven out of his mind and actually incapable of leaving his bed? How about if I sleep a little bit longer and forget all this nonsense. "Hey, there’s something falling down in there," said the chief clerk. Gregor tried to suppose to himself that what had happened to him might some day also happen to the chief clerk. There was no denying that anything was possible. Was he an animal, that music could move him so? He felt as if the way to the unknown nourishment he longed for were coming to light. We are sinful not only because we have eaten of the Tree of Knowledge, but also because we have not yet eaten of the Tree of Life. Variant translation: All human errors are impatience, a premature breaking off of methodical procedure, an apparent fencing-in of what is apparently at issue. 3 (20 October 1917); as published in The Blue Octavo Notebooks (1954); also in Dearest Father: Stories and Other Writings (1954); variant translations use "cardinal sins" instead of "main human sins" and "laziness" instead of "indolence". As quoted in The Unfinished Country: A Book of American Symbols (1959) by Max Lerner, p. 452; also in Wait Without Idols (1964) by Gabriel Vahanian, p, 216; in Joyce, Decadence, and Emancipation (1995) by Vivian Heller, 39; in "The Sheltering Sky" (1949) by Paul Bowles, p. 213; and in the poem "Father and Son" by Delmore Schwartz. To animalise is humane, to humanise is animal. 18; (9 November 1917) a slight variant of this was published in Parables and Paradoxes (1946): If it had been possible to build the Tower of Babel without ascending it, the work would have been permitted. Der Mensch kann nicht leben ohne ein dauerndes Vertrauen zu etwas Unzerstörbarem in sich, wobei sowohl das Unzerstörbare als auch das Vertrauen ihm dauernd verborgen bleiben können. Eine der Ausdrucksmöglichkeiten dieses Verborgen-Bleibens ist der Glaube an einen persönlichen Gott. Variant translation: One must not cheat anybody, not even the world of one's triumph. What an obstacle had suddenly arisen to block K.'s career! This question of yours, Sir, about my being a house painter — or rather, not a question, you simply made a statement — is typical of the whole character of this trial that is being foisted on me. You may object that it is not a trial at all; you are quite right, for it is only a trial if I recognize it as such. But for the moment I do recognize it, on grounds of compassion, as it were. One can't regard it except with compassion, if one is to regard it at all. I do not say that your procedure is contemptible, but I should like to present that epithet to you for your private consumption. Variant translation: Your question, Mr. Examining Magistrate, as to whether I am a house-painter — although you did not ask a question at all, you made a statement — typifies exactly the kind of proceedings that are being instituted against me. What an obstacle had suddenly arisen to block K.'s career! And this was the moment when he was supposed to work for the bank? He looked down at his desk. This the time to interview clients and negotiate with them? While his case was unfolding itself, while up in the attics the Court officials were poring over the charge papers, was he to devote his attention to the affairs of the bank? It looked like a kind of torture sanctioned by the Court, arising from his case and concomitant with it. Even that has its reason; it is often better to be in chains than to be free. Logic may indeed be unshakeable, but it cannot withstand a man who is determined to live. Where was the judge he had never seen? Where was the High Court he had never reached? He raised his hands and spread out all his fingers. But the hands of one of the men closed round his throat, just as the other drove the knife deep into his heart and turned it twice. One must fight to get to the top, especially if one starts at the bottom. There's no quiet place here on earth for our love, not in the village and not anywhere else, so I picture a grave, deep and narrow, in which we embrace as if clamped together, I bury my face against you, you yours against me, and no one will ever see us. The Messiah will come only when he is no longer necessary; he will come only on the day after his arrival; he will come, not on the last day, but on the very last day. Variant translation: The Messiah will come only when he is no longer necessary; he will come only on the day after his arrival; he will come, not on the last day, but at the very last. I can prove at any time that my education tried to make another person out of me than the one I became. Eternal childhood. Life calls again. Anyone who cannot come to terms with his life while he is alive needs one hand to ward off a little his despair over his fate — he has little success in this — but with his other hand he can note down what he sees among the ruins, for he sees different (and more) things than do the others; after all, dead as he is in his own lifetime, he is the real survivor. This assumes that he does not need both hands, or more hands than he has, in his struggle against despair. Perhaps it isn’t love when I say you are what I love the most — you are the knife I turn inside myself, this is love. Hat matt nicht die Augen, um sich sie auszureißen und das Herz zum gleichen Zweck? Dabei ist es ja nicht so schlimm, das ist Übertreibung und Lüge, alles ist Übertreibung, nur die Sehnsucht ist wahr, die kann man nicht übertreiben. Aber selbst die Wahrheit der Sehnsucht ist nicht so sehr ihre Wahrheit, als vielmehr der Ausdruck der Lüge alles übrigen sonst. Es klingt verdreht, aber es ist so. Aren’t our eyes made to be torn out, and our hearts for the same purpose? At the same time it’s really not that bad; that’s an exaggeration and a lie, everything is exaggeration, the only truth is longing, which cannot be exaggerated. But even the truth of longing is not so much its own truth; it’s really an expression of everything else, which is a lie. This sounds crazy and distorted, but it’s true. Moreover, perhaps it isn’t love when I say you are what I love the most — you are the knife I turn inside myself, this is love. The thornbush is old obstacle in the road. It must catch fire if you want to go further. Anyone who believes cannot experience miracles. By day one does not see any stars. Anyone who does miracles says: I cannot let go of the earth. Variant translation: Anyone who believes cannot experience miracles. By day one cannot see any stars. Das Böse weiß vom Guten, aber das Gute vom Bösen nicht. Selbsterkenntnis hat nur das Böse. - Die Acht Oktavhefte; published by BookRix, 9-8-2014. Now at last I can look at you in peace, I don't eat you anymore. If you only followed the parables you yourselves would become parables and with that rid of all your daily cares. To fight against this lack of understanding, against a whole world of non-understanding, was impossible. "Everything you say is boring and incomprehensible," she said, "but that alone doesn't make it true." "Oh well, memories,” said I. “Yes, even remembering in itself is sad, yet how much more its object! Don’t let yourself in for things like that, it’s not for you and it’s not for me. It only weakens one’s present position without strengthening the former one — nothing is more obvious — quite apart from the fact that the former one doesn’t need strengthening." When . . . some leisurely passer-by stopped . . . and spoke of cheating, that was in its way the stupidest lie ever invented by indifference and inborn malice, since it was not the hunger artist who was cheating, he was working honestly, but the world was cheating him of his reward. How much my life has changed, and yet how unchanged it has remained at bottom! When I think back and recall the time when I was still a member of the canine community, sharing in all its preoccupations, a dog among dogs, I find on closer examination that from the very beginning I sensed some discrepancy, some little maladjustment, causing a slight feeling of discomfort which not even the most decorous public functions could eliminate; more, that sometimes, no, not sometimes, but very often, the mere look of some fellow dog of my own circle that I was fond of, the mere look of him, as if I had just caught it for the first time, would fill me with helpless embarrassment and fear, even with despair. All knowledge, the totality of all questions and all answers, is contained in the dog. If one could but realize this knowledge, if one could but bring it into the light of day, if we dogs would but own that we know infinitely more than we admit to ourselves! "You asking me the way?" "Yes," I said, "since I can't find it myself." "Give it up! Give it up!" said he, and turned with a sudden jerk, like someone who wants to be alone with his laughter. Variant translation: The Policeman said to me, "You want to know the way? Give up! Just give up!" And he turned away like a man that wants to be alone with his laughter. We met a large group of workmen who were marching with flags and banners to a meeting. Kafka said, "These people are so self-possessed, so self-confident and good humoured. They rule the streets, and therefore think they rule the world. In fact, they are mistaken. Behind them already are the secretaries, officials, professional pohticians, all the modern satraps for whom they are preparing the way to power." "You do not beheve in the power of the masses?" "It is before my eyes, this power of the masses, formless and apparently chaotic, which then seeks to be given a form and a discipline. At the end of every truly revolutionary development there appears a Napoleon Bonaparte." "You don"t believe in a wider expansion of the Russian Revolution?" "As a flood spreads wider and wider, the water becomes shallower and dirtier. The Revolution evaporates, and leaves behind only the slime of a new bureaucracy. The chains of tormented mankind are made out of red tape." Gustav Janouch, Conversations With Kafka: Notes and Reminiscences (1953), page 71, London: Derek Verschoyle; frequently quoted as "Every revolution evaporates, and leaves behind only the slime of a new bureaucracy." Kafka described with wonderful imaginative power the future concentration camps, the future instability of the law, the future absolutism of the state Apparat. The whole art of Kafka consists in forcing the reader to re-read. His endings or his absence of endings, suggest explanations which, however, are not revealed in clear language but, before they seem justified, require that the story be reread. Albert Camus, Hope and The Absurd in the Work of Franz Kafka. The way in which he experienced estrangement was literature, with an intensity greater than that of any other writer of this century, more inexorably than Joyce or Proust or Mann. From this experience flows the power of Kafka’s works to comprehend all forms of alienation, and to suggest a response to political estrangement different from political counterterror: the effort to illuminate this condition by grasping through literature that play is the reward for the courage of accepting death. The work of Kafka … has been subjected to a mass ravishment by no less than three armies of interpreters. 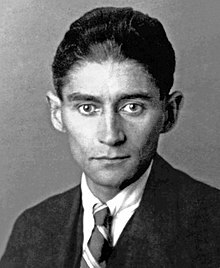 Those who read Kafka as a social allegory see case studies of the frustrations and insanity of modern bureaucracy and its ultimate issuance in the totalitarian state. Those who read Kafka as a psychoanalytic allegory see desperate revelations of Kafka’s fear of his father, his castration anxieties, his sense of his own impotence, his thralldom to his dreams. Those who read Kafka as a religious allegory explain that K. in The Castle is trying to gain access to heaven, that Joseph K. in The Trial is being judged by the inexorable and mysterious justice of God.